In recent years, IT specialists have struggled to keep up with the increasing amounts of cybersecurity attacks interrupting multiple industries. In fact, based on data from the 2018 Gartner CIO Agenda Survey, only about 30% of companies have hired an expert specializing in cybersecurity. If this is the case, what is the answer to the question board members are asking more and more frequently: “Who and what is maintaining the safety and protection of our company?” In most recent findings, the majority of companies’ answer to this question is “we are understaffed.” This gap in security talent is one of the leading causes of companies’ prevention in growth and innovation. Because of the lack of talent within this industry, C-suite executives of 93% of companies surveyed said they are eager to find new candidates for jobs associated with cybersecurity management. They are open and willing to discover new ways to find qualified people for the job, as well as implement training programs to ensure their success. However, doing this is a task in and of itself as Rob McMillan, research director at Gartner explains: “Finding talented, driven people to handle the organization’s cybersecurity responsibilities is an endless function.” Finding qualified candidates to fill these jobs is a challenge that requires time and money- two things companies cannot spare with the rapid increase in cyber-attacks. The important thing to note about these cyberattacks is that cybercriminals tend to act in ways they believe organizations will not anticipate. More recently, hackers are becoming more technologically advanced, and more often than not are prepared to adapt to different technologies to steal confidential data and perform attacks. 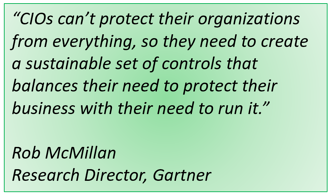 According to McMillan, "CIOs can’t protect their organizations from everything, so they need to create a sustainable set of controls that balances their need to protect their business with their need to run it.” This is exactly what the Apptega platform provides- a simple and easy way to manage all your controls and subcontrols to be ensured you are maintaining compliance and safety for your organization. Apptega was founded based on the high demand presented throughout the industry for a platform that can easily build, manage, and report a cybersecurity plan. Using Apptega will help bridge the security talent gap by providing a space for CIO’s to manage their cybersecurity plan - a job that could take the brainpower of multiple experts, costing money and valuable time. With instant access to custom reporting, budget allocation, and task delegation, Apptega satisfies the roles of the security experts the majority of companies are eagerly looking to fill and makes the process far more efficient - so you stay ahead of the increasingly intelligent cybercriminals crowding the market today. Want to learn more about how you can save time and money with the Apptega platform?